Light in alcohol and bursting with fresh crunchy dark fruits backed up with a lively acidity. Absolutely delicious wine and perfect summer drinking with all sorts of red and white meats. My mood is always lifted when a sample arrives from Terroirs in Donnybrook; they have impeccable tastes in wine (and all sorts of other nice things) and a clientele that is prepared to pay a few cents more for something good. This wine was no exception. 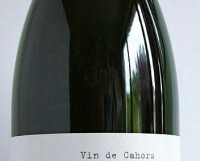 It has ‘vin de nature et vivant’ on the back label, suggesting a natural wine. Some of these low/no sulphur wines are good, others are, well, interesting. This was certainly in the former category – one of those wines where I fought with my wife for the last few precious drops.